In 2015, use varied significantly by age group for most tobacco products,38-41 although not cigars42 (Figure 4.5). Young adults aged 20-24 reported the highest prevalence of use of other tobacco products, followed by youth aged 15-19. 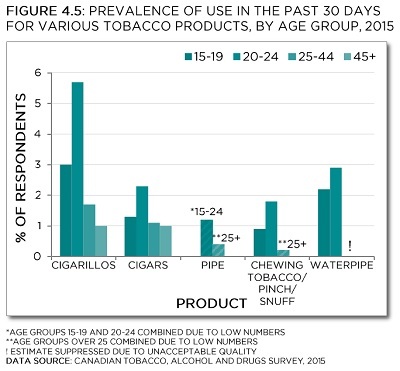 After young adulthood, prevalence of use appears to decrease for all products (Figure 4.5). Between 1999 and 2015, this pattern of high use among the younger age groups (especially age 20-24), declining with increasing age, applied to cigar/cigarillo use in almost all years with available data (Figure 4.6). Use of cigars/cigarillos appears to have increased over time in all groups until around 2008, after which rates generally decreased. 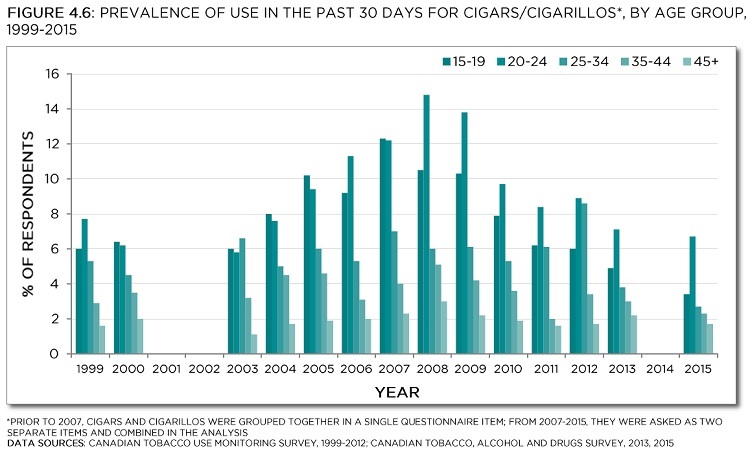 This pattern was particularly pronounced among young people: cigars/cigarillo use among youth aged 15-19 has declined steeply and steadily; among young adults aged 20-24, after an initial large drop, progress has been slower. 2.2 [1.1-3.3] 2.9 [1.8-3.9] ! !